Olympus Mons is the largest volcano in the Solar System. While it is known that it was constructed of lava flows, many aspects of this titanic volcano remain puzzling. For example, the base of the volcano is marked by a steep scarp (cliff) that is up to 8000 meters (26,000 feet) tall. One idea is that the volcano is so large that it is falling apart under its own weight, such that the outer edges are collapsing in massive landslides. By combining two HiRISE observations (PSP_001432_2015 and PSP_001630_2015), we can see an approximately 6 km (3.7 mile) wide portion of this scarp in three dimensions. The topography can be seen in this anaglyph by using red-blue glasses. The rugged topography at the edge of the scarp, with kilometer-scale pieces of the volcano pushed up or pulled apart, fits the idea that the lower part of Olympus Mons is riddled with faults. 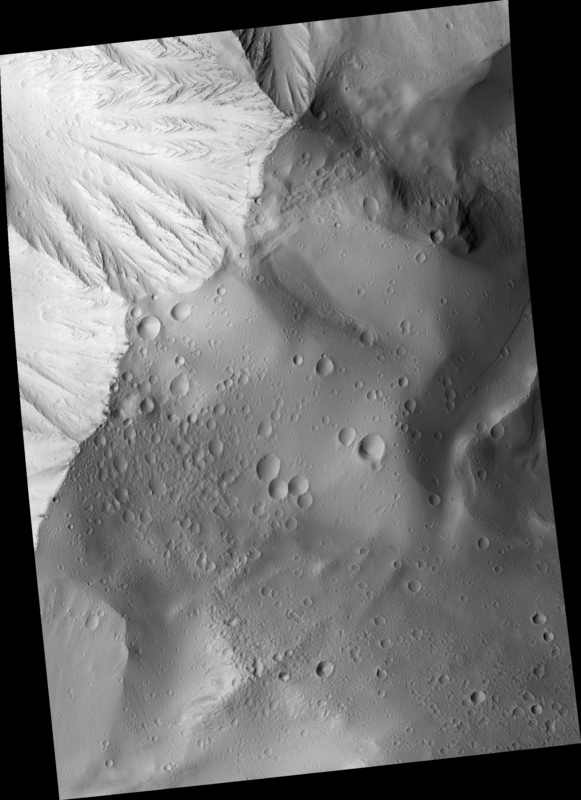 However, this data covers only about 0.3% of the scarp, so more images will need to be studied to understand how Olympus Mons is gradually being destroyed. Image PSP_001630_2015 was taken by the High Resolution Imaging Science Experiment (HiRISE) camera onboard the Mars Reconnaissance Orbiter spacecraft on 01-Dec-2006. The complete image is centered at 21.5 degrees latitude, 222.4 degrees East longitude. The range to the target site was 289.6 km (181.0 miles). At this distance the image scale is 29.0 cm/pixel (with 1 x 1 binning) so objects ~87 cm across are resolved. The image shown here has been map-projected to 25 cm/pixel and north is up. The image was taken at a local Mars time of 03:35 PM and the scene is illuminated from the west with a solar incidence angle of 52 degrees, thus the sun was about 38 degrees above the horizon. At a solar longitude of 143.7 degrees, the season on Mars is Northern Summer.